There is no doubt the women play a critical role in bringing out the best in the people around her by forming strong bonds that creates positive impact. Tupperware Brands recognizes these strong and confident Filipinas who have achieved great things and inspired others to be the best they can be. It supports women who have proven that confidence brings about power to change lives. Now on its second year, Tupperware Brands Philippines’ Women of Confidence honors five exemplary Filipinas who helped bring about change, one family and one community at a time. As part of its commitment to enlighten, educate and empower women, Tupperware recognizes women who have achieved great things and inspired others to realize their potential and be the best that they can be. “Filipinas are strong and independent, passionate and compassionate – a perfect mix of the traits of a woman of confidence. Through the Search for Women of Confidence, we honor these outstanding Filipinas who initiated positive change in their family lives, fields of work, and community through their exemplary attitude and self-assurance,” explained Perry Mogar, Tupperware Brands Philippines managing director. Each of the nominees were judged based on their story of confidence. The candidates' act of confidence in bringing about about positive change in her family, her community, or in society were highlighted. To know more about the 2013 Tupperware Brands Philippines Search for Women of Confidence, visit I Am Confidence in Facebook, www.facebook.com/tupperwarebrandsph/iamconfidence and the I Am Confidence microsite, www.confidence.ph. 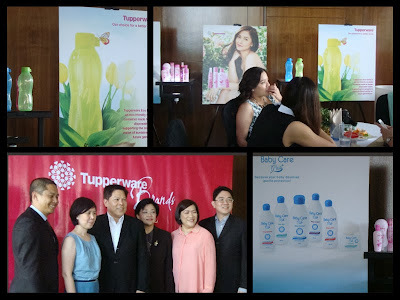 You may also visit the Tupperware Brands Philippines website at www.tupperwarebrands.ph. Tupperware Brands Philippines, Inc. is the authorized distributor of some of the world’s prestigious brands including Tupperware, Colour Collection, Ivana, White Result, Wonderbra, Playtex, Hanes, Baby Care Plus+ and Kids Plus+.